I know, I know the whole 2 posts in one day thing, but this is really just half a post and I think Mrs. Squirrels needs a smile! For a SUPER TEACHER!! If they only knew what you were REALLY made of!! Have a SUPER week next week!!! hehehhe! that is TOO fun!! I'm sure she will L.O.V.E that!! HA!!!!!! Who knew all these squirrel things existed??? Too funny! She'll love it. Awwww thanks for thinking of me! 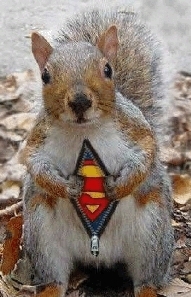 I drowned my sorrows in lots of fried food tonight:) Super Squirrel really made me smile! That's so funny! We had a teacher who retired a few years ago and her party was squirrel themed. I didn't get half the jokes because they were old inside ones, but they came up with great pics like this one! I just found your blog and am a new follower!